Who Knew Nantucket Bracelets Would Be So Hard To Find? Why must some things be so difficult? I guess this is a case of taking things for granted. Living minutes away from the shore allowed me to get gifts with a unique nautical feel... things that I'm now finding are very hard to order online not to mention find in stores. Oh well, anyone can suffer burn out... especially when everyone and their mother wants one. So my quest, which I foolishly thought would be an easy one, was to look for some alternatives. This turned out to be horrendously frustrating. Update: The Nantucket Knotworks seems thankfully back in action and while they still do not seem to be selling pieces from their website they have compiled online sources for all of their products sold online! Take a look HERE. I've also created a DIY tutorial on how to easily create your own sailor style bracelet, find it here! One good thing is I did find a company, The Sunkin Ship, selling a Nantucket Knot Works bracelet. This one is rather simple and not the sort I was looking for but stacked together, I think it could be a rather swell gift. 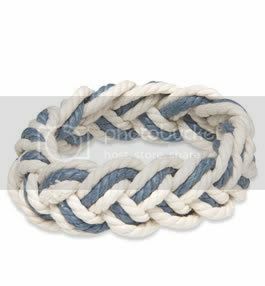 Next I was able to find the AE Nantucket Rope Bracelet which comes in two colors (see the image above for the blue and white style). 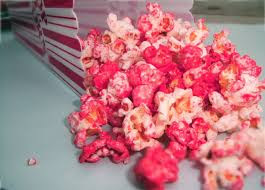 The problem with these of course is the question of where are these made and who makes them? All the other bracelets I came across, including those sold out at J Crew and in stock at Forever 21 and Heritage 1981 looked so sloppy in construction people will likely wonder why you're always walking around with a hair tie on your arm (especially when you're a guy with short hair). Another blow came from etsy.com where I couldn't find anything. I'm still in awe of that one. Update (2009): Just found an etsy store selling bracelets called Mystick Knotworks. I'll keep on the lookout and update this if anything better pops up. If all else fails I'll try to teach myself the Turks knot and make my own bracelets (this bloke did) until I can get back to the shore shops and snag some more for my stash. Update: (March 4th 2008) I've just found another source for Nantucket bracelets that are more in the style I was on the lookout for. Bob Elton of http://www.doesknotwork.com/ creates some amazing 5 lead Nantucket bracelets with my favorite being the one in white. He also sells them in his ebay store Lake Samish Trading Post. These look to be your best bet for authentic handmade sailor bracelets when it comes to online ordering. Nantucket Knotworks has also compiled online stores selling their iconic pieces, see it here. Lastly find my new DIY version of the sailor bracelet above over here, it's quite easy and quick to make. I'm sl glad you found this helpful Kate... Bob Elton's bracelets are some of the best I've found online. The funny thing is, when I was on Nantucket island the bracelets were everywhere. Now if only they would go online to sell their wears! Here you will find both nylon and cotton designs in everything from the traditional three strand design to the more complex herringbone and multi colored designs. Custom orders are accepted. All work is handmade and shipped direct to you. Thank you so much for your mention of our shop, Mystic Knotwork. This has been an adventure rebuilding my grandfather's business and taking it online. We have sold so many of these during the 1980's on the coast of New England and Key West/Great Pine Key where my grandfather was a snowbird. Since you mentioned us, I have moved from my job in IT back to full time knot tying. Keeping with my grandfather's tradition, all of our knots are tied by the family and all of our cord is grown and made here in the US. I'd love it if you take another look at our website because I was thrilled that you noticed us only a few months after we first ventured online. Thank you so much for coming here and leaving such a kind comment... plus further history about Mystic Knotwork is amazing. Loved the fact the everything in the bracelet is actually made in the US! The amount of people coming to the site looking for these bracelets continue to be unreal so I'm going to have to do some separate posts on some of my favorite online finds. I did indeed venture to your website and wow, your selection in incredible! Hope to be able to feature some of your actual pieces soon. All the best to you and your family at Mystic Knotwork Matt. Hi, I just found this article from 2008. You mentioned our little Etsy shop, and I was shocked you found me before I remember being there :) Anyway, Mystic Knotwork has grown quite a bit since 2008. We still tie them all ourselves and the sailor bracelet we make can be found in over 200 retail stores now. Still handmade. I also looked at some of the links in this original article and found some broken. I'd love the chance to share our family story and let you know about a wild ride online that started within months before you found our little Etsy shop.